Any time you want to use text in Python, you are using strings. Python understands you want to use a string if you use the double-quotes symbol. Once a string is created, you can simply print the string variable directly. You can access characters using block quotes. Variables can be of the string data type. They can hold characters or text. If you create string variable x. You can show it on the screen using the print() function. Individual characters can be accessed using blockquotes, counting starts from zero. The first character starts at zero. This may be a bit counter intuitive, but has historic reasons. By using a colon you can create a substring. If no start or end number is written, Python assumes you mean the first character or last character. This example does a lot of string operations like printing text, numbers, combining strings, slicing and accessing elements. 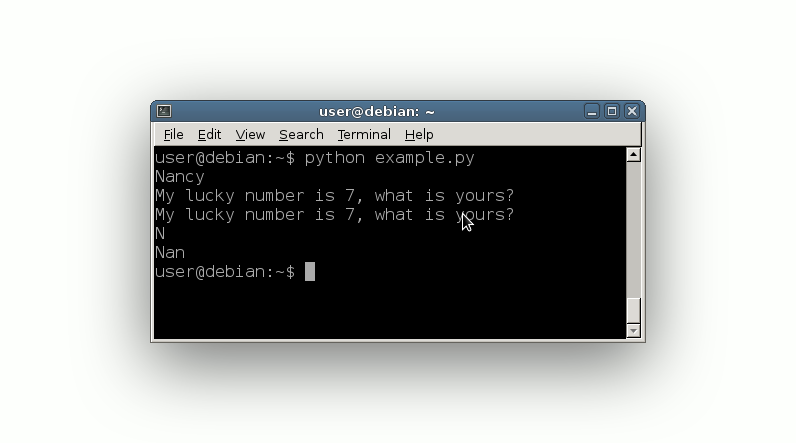 s = "My lucky number is " + str(7) + ", what is yours?" Make a program that displays your favourite actor/actress. Try to print the word ‘lucky’ inside s.
Try to print the day, month, year in the form “Today is 2/2/2016”.